McDonald's Not Moving To Stop Michael Keaton's Biopic - Are You Screening? There are a lot of ways this could go, but it’s good to see that there won’t be a fight about it. There may be a lot of comment after the fact, and I don’t know that I care any more about a McDonald’s movie than I did about a Facebook one, but I am interested to see what Michael Keaton hopes to do with it. As I’venoted many times, last year was so biopic-heavy that it started to get boring, and other critics have mentioned the fact that, for general audiences at least, it might do to be a little more selective, as opposed to trying to flood the market. But, even if this doesn’t jump out as being something everyone needs to me, it’s goodto see that we’re not going to have to go through whatever legal mess might arise. What’s your take on this? Do you care? Is this something that can be spun into an interesting movie? As the restaurants multiply, Kroc ultimately snatches the McDonald’s name from them. The script maintains that Kroc cheated the brothers out of $200 million and, until his death in 1984, pretended to have made up the name McDonald’s himself. 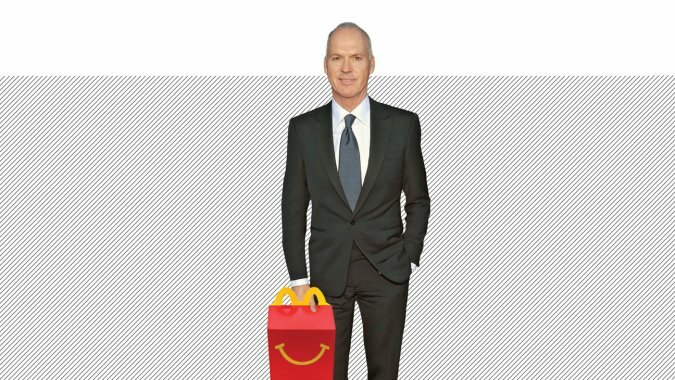 via McDonald’s Won’t Try to Stop Michael Keaton’s Unflattering Biopic – The Hollywood Reporter.